In July 2018, jurors in a talcum powder injury lawsuit ordered Johnson & Johnson (J&J) to pay $4.69 billion to 22 plaintiffs and their families who claimed their ovarian cancer was caused by talcum powder products. Just two months earlier, a New Jersey jury awarded $117 million to a couple to resolve their talcum powder lawsuit after their attorney claimed that the female plaintiff's cancer was caused by decades of using Johnson & Johnson talcum powder. 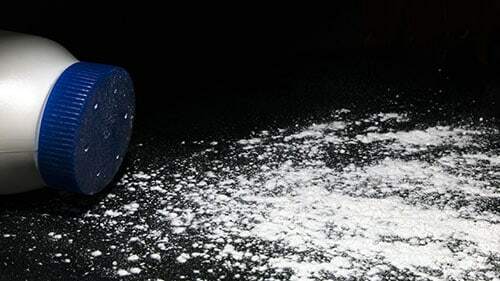 Rosenfeld Injury Lawyers LLC represents victims of talcum powder injuries that caused their Ovarian Cancer and other types of professional negligence. Our law firm has successfully prosecuted cases for our clients who were never informed that using talcum powder for feminine hygiene could lead to serious injuries including Ovarian Cancer. Our attorneys are available to answer any legal questions on how to receive the monetary compensation you deserve if your injuries were a result of someone else's negligence. Should you have additional questions, we invite you to contact our office for a free review of your legal rights. What is a Talc-based Product? Talc, or talcum powder, is the essential ingredient in baby powder and feminine hygiene powder that serves as a soft and powdery foundation in the products. However, it is also an ingredient in many other types of products including contraceptives (diaphragms and condoms), cosmetics, anti-chafing products, deodorants, antiperspirants, and more. The two most popular talc-based products are Johnson & Johnson's baby powder and Shower to Shower. Cancer Prevention Research Magazine published an article showing the result of a study that found using talcum powder products in the groin (perineal) area increases a woman's chance of developing ovarian cancer by 30% or more. However, medical science has known of the significant complications of using Talc since 1971 when a report was published in the British Journal of Obstetrics and Gynecology. The study revealed that researchers had found talcum powder in three-fourths of all ovarian tumors examined in the research study. Another study published in 1982 in the Cancer Journal showed the results of epithelial ovarian cancer studies where talcum powder was detected in the cancer's epithelial cells. Ten years later in 1992, another study published in Obstetrics and Gynecology investigated numerous cancer cases and found a link between an increased risk of developing ovarian cancer and using talcum-based products. In 2003, and anticancer research publication revealed 16 reports that identified a 33% increased risk of developing ovarian cancer in women who had used talcum powder for perineal hygiene use. However, the research did not identify a causal relationship. In 2008, Harbor researchers presented evidence on cancer epidemiology comparing more than 1800 healthy women with 1400 people living with ovarian cancer and their use of talcum powder. The study revealed a 35% increased risk of developing ovarian cancer from using talc-based products. In 2011, Cancer Causes & Control published a study that identified a “modest association” between ovarian cancer and talcum powder use. In 2013, cancer prevention research identified a 20 to 30% increased risk of developing ovarian cancer when using talcum powder for feminine hygiene in the genital area. Even though there have been significant research studies linking talc use and cancer development, talc-based product manufacturers including Johnson & Johnson still dispute the findings. Eva Echeverria v. Johnson & Johnson – In 2017, a jury ordered Johnson & Johnson to pay $417 million and one of the largest verdicts to resolve a talcum Powder lawsuit. The 63-year-old plaintiff held the company liable for their failure to warn her of the potential risks of using talc-based products and the development of terminal ovarian cancer. In 2017, the plaintiff was diagnosed with ovarian cancer. A softball-size tumor was removed by a surgeon. Unfortunately, because the victim's declining health, she was not able to attend the lawsuit trial. Instead, her testimony was shown to the jury through a recorded deposition that revealed that she had used Johnson & Johnson baby powder from the time she was eleven until 2016. Lanzo v. Johnson & Johnson – A Middlesex, New Jersey jury has ordered Johnson & Johnson and Imerys SA to pay a banker and his wife $117 million in financial compensation after the husband was diagnosed with cancer after using talcum powder for decades. The jury verdict included $7 million in damages to the banker's wife, $30 million in compensatory compensation to the victim, and an additional $80 million in punitive damages to punish the companies for knowingly manufacturing and selling a defective product. The lawsuit document reveals that the plaintiff had used Johnson & Johnson baby powder and Shower to Shower for more than three decades. During that time, the banker inhaled the powder which caused him to develop mesothelioma, a highly aggressive and often fatal cancer that impacts the lungs' lining. The attorneys working on behalf of the plaintiffs claim that Johnson & Johnson held safety information from the consumer since the 1960s knowing there were significant health risks associated with talcum products that contain asbestos. 22 Plaintiffs v. Johnson & Johnson – In 2018, the jury awarded 22 plaintiffs $550 million in compensatory damages and another $4.14 billion in punitive damages to resolve multiple talcum powder lawsuits in a St. Louis Circuit Courtroom. The plaintiffs had filed cases in Missouri, North Dakota, Georgia, California, Texas, the Carolinas, New York, and Arizona. Johnson & Johnson spokesperson Carol Goodrich called the jury's verdict unfair and indicated that the company would appeal the case. The spokeswoman stated that “Johnson & Johnson remains confident that its products do not contain asbestos and do not cause ovarian cancer and intends to pursue all available appellate remedies.” The lead plaintiff counsel Mark Lanier stated that the talcum powder product company had covered up evidence for more than four decades that many of its products contain asbestos. Many women are pursuing lawsuits against Johnson & Johnson and other talc-based product manufacturers after they were diagnosed with ovarian cancer after using talcum powder for years. These plaintiffs are claiming that the product manufacturer failed to warn them of the known associated risks of their dangerous products. In February 2016, A St. Louis, Missouri jury awarded $72 million to the family of a deceased woman who had developed terminal ovarian cancer. The award involved $10 million in compensatory damages and another $62 million in punitive damages. In May 2016, a plaintiff was awarded $55 million by Missouri jury after proving that routine use of talc-based products manufactured by Johnson & Johnson caused her development of ovarian cancer. In October 2016, a Missouri jury awarded a $70 million verdict award to the plaintiff who claims she had developed ovarian cancer after years of using Johnson & Johnson baby powder. While nearly all personal injury lawsuits settled early on during the insurance claims process, talcum powder settlements seem to take much longer. Currently, Johnson & Johnson and other talc-based product manufacturers are pushing back hard and agreed to settle out of court claiming that their products are safe for public use. Even so, juries are responding differently and instead awarding plaintiffs significantly large verdicts that include both compensatory and punitive damages to punish the manufacturer for marketing and selling a dangerous product. Non-tangible damages including pain, suffering, loss of support, loss of enjoyment, loss of consortium, mental anguish, emotional distress, and grief. For decades, talcum powder product manufacturers have known that talc with asbestos has been linked to the development of ovarian cancer. Even with this knowledge, they continue to make products including cosmetics that contain talcum powder that as of yet is not regulated by the FDA (Food and Drug Administration). Without government regulations, these manufacturers have decided not to warn the consumer of the potentially serious side effects using their talc-based products. However, the circumstances in your case are unique and likely require the skills of a personal injury attorney who specializes in product liability cases to determine if you have a claim for compensation. Your lawyer will explain what you should expect when building a case, litigating the claim, and how long it will take to resolve your lawsuit. The talcum powder injury attorneys at Rosenfeld Injury Lawyers LLC understand your medical condition is not your fault but the responsibility of a large company who never warned you of their dangerous product. We have successfully obtained millions on behalf of the victims and their family members to ensure they were adequately compensated to cover their medical expenses, household bills, lost wages, loss of future earnings, pain, suffering, and emotional damage and we can help your family too. Due to its core ingredients, talcum powder has recently been criticized for its links to cancer including ovarian cancer. Here are recent news stories and reports surrounding the controversy over talcum powder. Johnson &Amp; Johnson Case: Can Talcum Powder Really Cause Cancer?